If you’ve just adopted a Mustang from the Bureau of Land Management, (BLM) thank you for giving this horse a home. You must keep in mind that their eating habits are different from other domesticated horses. Living on the range until arriving at the BLM pens, Mustangs fed on wild grasses and plants. A horse’s digestive tract constantly secretes stomach acid and bile, fermenting forage, whether eating or not. These horses have not consumed quality hay or grains when arriving in the holding pens of BLM where they are fed mainly alfafa which is less expensive and readily available. After living in a herd your Mustang may be stressed at being alone and could develop gastric ulcers. Recommendations are to continue to feed alfafa for a time as it can help reduce the risk of ulcers. Check with an equine nutritionist or your vet as to when your horse is ready to be transitioned to a grass hay and other feed perhaps with some alfafa. 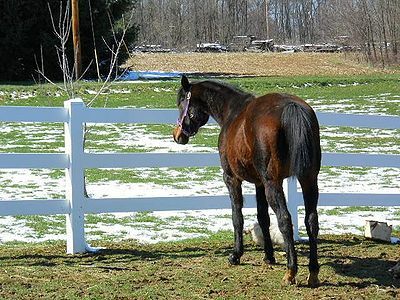 Consider providing a slow feeder for your horse as it mimics grazing. Slow feeders also help maintain a healthy weight as your Mustang may not be able to regulate his intake. Always have fresh water available. Buckets for feeding or watering could present a problem. Your horse may be fearful of a bucket at first. 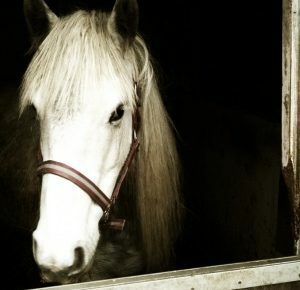 Horses are prey animals and use sight to keep themselves safe. Buckets can eliminate their ability to see what’s going on around them. You may want to use a water trough at first but make sure it’s secure and can’t be tipped over. Make sure your Mustang has salt in block form available at all times. Another suggestion is to keep your Mustang in a rather small space with fencing high enough to prevent escape. Check with your vet or an equine nutritionist as to supplements and when and where to let your Mustang free to graze with other horses. Give your Mustang time to adjust to his new surroundings and home. Be patient and you’ll soon create a strong, loving bond together.